Message: I appreciate the posting about ordering pizza by NFC. I contacted the company to ask if there was a simple way for a pizza shop to order these tags and what the cost was. The tags, at a qty of 1000, are .85 each unless the software/app is used to program them by the shop or marketing person. We’re going to talk on Monday, but I wonder what % of phones are NFC enabled and whether activation is automatic or if the user must take some action with their device. Answer: NFC tags you get in different shapes, types and price level. Some of the tags have more or less memory. Some of them are thin as paper, other are moulded round plastic and further are available as key fob. The key fob is something that you can have always with you, the paper-thin version you can stick inside of the TV remote control and the round shaped version you can stick on the fridge. 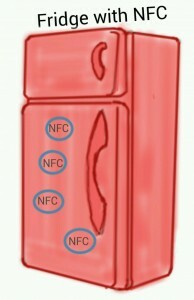 To stick on fridge, you will need NFC tags that can be mounted on metal. This type of NFC tag is maybe more expensive. Anyhow, you get it with print or without. With printed version is then an always visible advertising at key fob or fridge. At key-fob the people will show it to their friends and the friends will maybe start to order from you too. The same NFC tag for ordering pizza can be used for other things as well. In the car you can power on/off the Bluetooth, GPS, WIFI and the app for rout planning. Your tag will be visible for everybody. All friends in the car will read your advertising again. To trigger something you need no memory. Each tag has a unique ID. With memory you can get activate further features, like discount. If the tag at fridge will be use by different people in same home, then you can offer a discount as soon the ordered several pizzas in a period. And you can store links to special deals on the NFC tag. The NFC phone can write to the NFC tag as well. One of my business friends developed an app for paying the parking area in big cities. I have left the food industry 30 years ago. Cooking is still one of my hobbies. My money I make as Field Application Engineer for Wireless applications. Just watch the video to understand how it works. The CES 2013 was full with new devices for kitchen and living room with access by NFC. List of NFC powered equipment in my Google+ (not complete, but a little bit of everything).